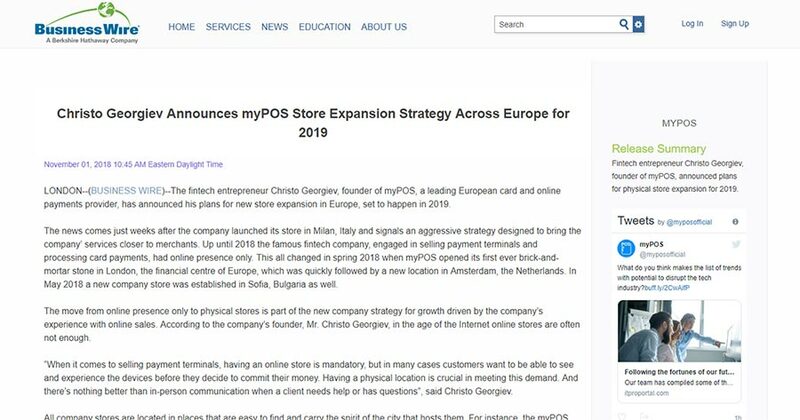 LONDON–(BUSINESS WIRE)–The fintech entrepreneur Christo Georgiev, founder of myPOS, a leading European card and online payments provider, has announced his plans for new store expansion in Europe, set to happen in 2019. The news comes just weeks after the company launched its store in Milan, Italy and signals an aggressive strategy designed to bring the company’ services closer to merchants. Up until 2018 the famous fintech company, engaged in selling payment terminals and processing card payments, had online presence only. This all changed in spring 2018 when myPOS opened its first ever brick-and-mortar stone in London, the financial centre of Europe, which was quickly followed by a new location in Amsterdam, the Netherlands. In May 2018 a new company store was established in Sofia, Bulgaria as well. The move from online presence only to physical stores is part of the new company strategy for growth driven by the company’s experience with online sales. According to the company’s founder, Mr. Christo Georgiev, in the age of the Internet online stores are often not enough. “When it comes to selling payment terminals, having an online store is mandatory, but in many cases customers want to be able to see and experience the devices before they decide to commit their money. Having a physical location is crucial in meeting this demand. And there’s nothing better than in-person communication when a client needs help or has questions”, said Christo Georgiev. All company stores are located in places that are easy to find and carry the spirit of the city that hosts them. For instance, the myPOS store in London is situated next to Hyde Park and Buckingham Palace, while the store in Amsterdam is located close to the centre of the city and next to channels that Amsterdam is so famous with. myPOS is all set for major expansion in 2019 when the company plans to open no less than seven more stores across Europe. The first half of 2019 will see myPOS stores debut in Paris, Bucharest, Munich, Lisbon and Warsaw. In the second half of 2019 the company plans to open stores in Prague, the Czech Republic and in Helsinki, Finland. 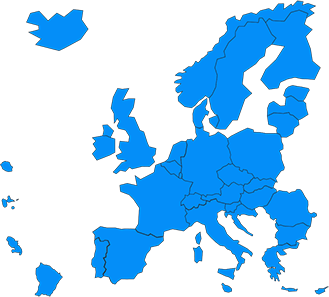 The ultimate goal is to be present in all major European countries – an accomplishment that is to be achieved in the next several years. The myPOS package includes a smart POS device, a free myPOS account with a business VISA card and access to additional merchant services. This entry was posted in In the Press and tagged Christo Georgiev, myPOS Store. Bookmark the permalink.